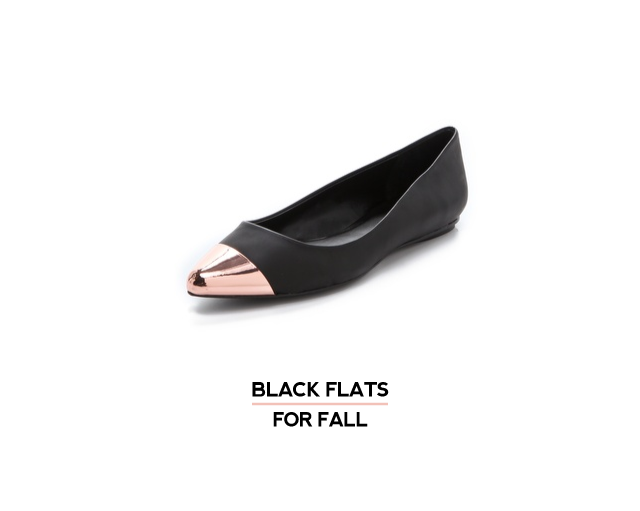 i'm a big believer in having a nice pair of black flats when september rolls around. i live in them. for, like, the entire fall and winter. do those have a ROSE GOLD TOE??! you and me both. in my opinion, the absolute perfect shoe is a great black flat. is it just me of is it so difficult to find pretty, black flats with a pointy toe? thanks for solving this for me! I love black flats. Why are pointy toe flats so hard to find? I think they are so elegant with a suit. I wear flats when my heels make my feet tired so this is a mystery I am often wondering - round toes aren't elegant, you know?